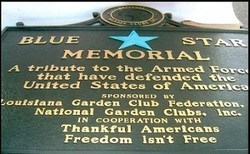 Blue Star Markers - Louisiana Garden Club Federation, Inc. The Blue Star Memorial Marker Program of the National Garden Clubs, Inc. began in 1945 to honor the men and women serving in the Armed Forces during World War II. The name was chosen for the star on flags displayed in homes and businesses denoting a family member serving. Garden clubs pictured a ribbon of living memorial plantings traversing every state. The designation of Blue Star Highways was achieved through petitions to the state legislatures and cooperation with the Departments of Transportation. A uniform marker was designed to identify the Highways. The Blue Star Memorial Program grew to extend thousands of miles across continental U.S., Alaska, and Hawaii. All men and women who have served, are serving, or will serve in the Armed Forces of the United States are included. Markers continue to be dedicated each year on highways, Veterans’ facilities, National Cemeteries, parks, and civic and historic sites, showing our appreciation for those who defend our country. No marker may bear an individual’s name. These markers are designed to pay tribute to the Armed Forces as a whole. *A garden club votes to have a marker. An appropriate location is selected and the type of marker for that location is chosen. *Contact the State Blue Star Memorial Chairman for forms instructions. *Contact local or state authority responsible for location. *Send order form and check to State Blue Star Memorial Chairman for processing. *Clubs may solicit other civic organizations to help with funding, construction, planting, and maintenance. On May 24, the Blue Star Memorial Marker which had been placed at the entrance to the Naval Air Station Joint Reserve Base New Orleans located in Belle Chasse, Louisiana in 2008 was rededicated by a joint military/civilian celebration that was well attended by both segments of society. Following the national anthem, sung by Navy Counselor First Class Sarah Prather, Joe Baucum (far left) Vietnam veteran and President, Environmental Consultants Council, Louisiana Garden Club Federation (LGCF) led the pledge of allegiance. Captain Mark Sucato (not pictured), NAS JRB New Orleans Commanding Officer, gave welcoming remarks and credit to those who were responsible for the relocation and upgrade of the Blue Star Memorial Marker. The Marker now shares a large concrete pedestal with a bronze statue of a naval seaman saluting a nearby national flag. Following Captain Mark, Louisiana Lieutenant Governor Billy Nungesser (third from left) and Wyatt Lombrano (not pictured), Louisiana State Commander of the Veterans of Foreign Wars, each gave greetings and remarks. Coleen Landry (second from left), Chairman LGCF Live Oak Society, rendered an oral history of the Blue Star Marker Program. Mary Hazen (far right), LGCF Blue Star Memorial Chairman then dedicated the marker which was accepted by Captain Mark Sucato. A tribute of flowers were laid and blessed by Kathy Boudreaux (second from right), LGCF District I Director, and Reba Mackey (third from right), LGCF District II Director. The attendees were all treated to refreshments and the exchange of well wishes and a spirit of patriotism. The entire dedicatory program was impressive and heart-warming. * More details can be found on National's website.